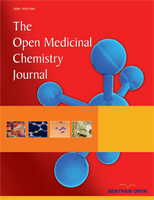 Three major flavonoid chamomile components (quercetin, apigenin-7-O-glucoside and rutin) were subjected to oxidative metabolism by cytochrome P-450 of rat liver microsomal preparations. Changes over time in their respective concentrations were followed using reversed-phase HPLC with UV detection. No clean-up had to be applied as only the specific flavonoid had to be separated from the background components originating from the rat liver microsome. Neither the concentration of apigenin-7-O-glucoside nor that of the diglycoside rutin decreased during one hour of exposure to rat microsomal treatment. In contrast, the concentration of quercetin, a lipophilic aglycon, decreased. Our analytical HPLC results complement the in silico calculated lipophilicity (logP) of these compounds; the relatively high lipophilicity of quercetin appears to predispose it to oxidative metabolism in order to decrease its fat solubility. In contrast the much less lipophilic compounds apigenin-7-O-glucoside and rutin were resistant in vitro to microsomal treatment. Keywords: Microsomal treatment, cytochrome P-450 dependent oxidation, HPLC, quercetin, apigenin-7-O-glucoside, rutin. © A.A. El Maghraby; Licensee Bentham Open.